Before I found easy gentle cleansers like the affordable Neutrogena Ultra Gentle Hydrating Cleanser ($11-12 CDN) that gently cleanse the skin with minimal effort, washing away with a splash of water without leaving the skin stripped or irritated in some way, I wasn’t a believer in washing my face in the morning but now that I have, I can’t bring myself to turn back as my skin is far clearer. Once-or-perhaps-twice per week, when I’m tempted I go for the extremely gentle salicylic-acid-based chemical exfoliant, namely the underrated — and way superior to the dreadful offerings in the three step formulation — Clinique Mild Clarifying Lotion ($16 CDN). With only 0.5% strength salicylic acid, this “toner” provides the gentlest chemical exfoliation and I tend to go for this when my skin is a little congested in areas — not too rare of an occasion, if I’m honest. Being interested in the wonders of a serum as of late, I’ve recently added the La Roche-Posay Rosaliac AR Intense Localized Redness Serum ($35 CDN)into the morning skincare dash and so far I’m pleased with the soothing and hydrating power of this lightweight gel-like textured serum. I don’t have rosacea, so I can’t report on that front but this does help calm the skin, redness included. Although there’s no SPF or anything of the sort that would confine this moisturizer to use in the morning, I tend to go for the lovely REN Evercalm Global Protection Day Cream ($54 CDN) that offers that essential soothing action with lightweight fast-absorbing hydration. But I still wouldn’t rank it above the Caudalie that I do not own at the moment but went on and on about last year for good reason, if you know what I mean. Because I live in a cooler climate and have extraordinary issues with the whole sunscreen shebang – I’m allergic to most chemical sunscreens – I do that naughty thing and only wear SPF if I’m going to be spending the day outdoors in the sun and true to its name, the Avene High Protection Mineral Cream SPF 50 ($30 CDN)delivers. Like all mineral sunscreens, this one does bring a bit of a white cast and because of this the cream is tinted and pulls slightly pink-y on me (but not too terribly) but this remains the gentlest and most-effective sunscreen I’ve tried to date, never burning the eyes to boot. It has a hydrating texture that isn’t the most lightweight so on occasion I’ll skip on either the serum or moisturizer, as there’s no need for excess product. 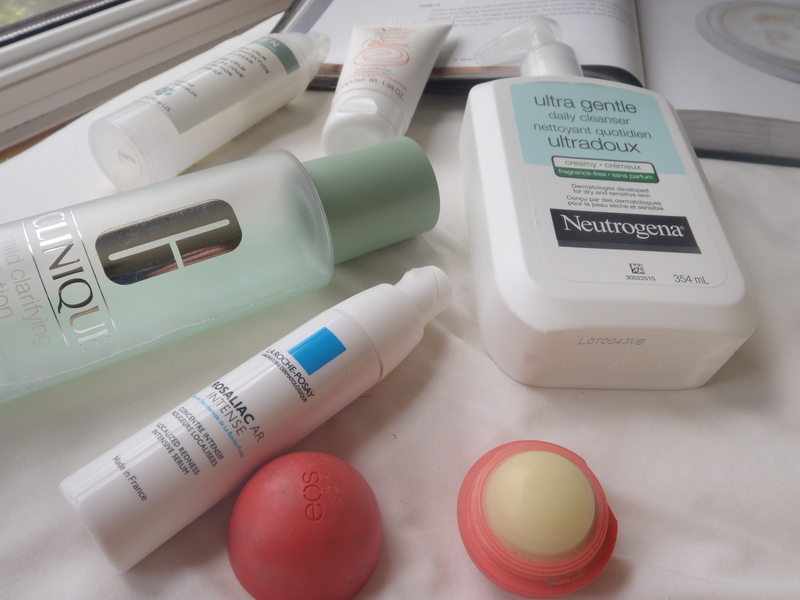 It’s not life changing or anything of the sort but it hydrates my lips and works nicely under lipsticks so the EOS Smooth Sphere Lip Balm in Summer Fruit ($4 CDN) has my seal of approval. The texture isn’t overly slippy so it fares well under lip products and the scent doesn’t bother me like most fruit scents – if you ask me, it smells like authentic peaches. What are your go-to products in your morning skincare routine?